Since we have much more information about the past than about the future, our brains might have developed a bias which makes us assume a causal connection from the past to the future. If we collected billions of data points between the first and second world war and fed the data points to a machine learning algorithm, would the machine learning algorithm believe that the data points from the first world war necessarily gave rise to the data points from the second world war, or could it perhaps also come to the conclusion that the data points from the second world war retro-caused the first world war? I suspect that it might be an equally valid interpretation that the data points from the second world war retro-caused the first world war. You might argue that according to the many-worlds interpretation of quantum physics, there isn't necessarily just one possible future, but rather an almost infinite number of possible futures. However, according to the multiple histories interpretation of quantum physics, there isn't necessarily just one past either. Maybe our belief about the past causing the future is just a bias formed because our brains have much more information about the past than about the future. That is not how MWI works. QM obeys forwards causality, and not retrocausality. What they're seeing must have an 'also a consequence' relationship to the causes of more notable events. Or QM is actually wrong and the universe is even weirder. I'd put my money on the former. Maybe you are right. I just find it somewhat suspicious to assume forward causality since we have much more information about the past than about the future. If I had as much information about the future as I now have about the past, and as little information about the past as I now have about the future, I am convinced that I would assume the universe to follow retrocausality. But I don't have as much information about the future as about the past, and maybe there is a reason for that. Maybe there is no retrocausality. The fundamental laws of physics work in the same way whether time moves forward or backward. Yet, while a glass can fall and scatter shards across the floor, glass shards never gather together and leap back onto the counter to form a complete glass. The source of this temporal asymmetry is one of the deepest mysteries in physics. We tackle this problem by combining two different disciplines, computational and quantum mechanics. Our results illustrate that the asymmetry could emerge from forcing classical causal explanations on observations in a fundamentally quantum world. Computational mechanics asks the following question: Given a sequence of observations, how many past causes must we postulate to explain future behavior? This quantity is asymmetric when time is reversed. There is an unavoidable memory overhead cost for modeling a process in the “less-natural” temporal direction—one must pay a price to enforce explanations adhering to a less-favored order of events. We show that quantum models always mitigate this overhead. Not only can we construct quantum models that need less past information than optimal classical counterparts, these models can always be reprogrammed to model the time-reversed process without additional memory cost. This remains true even for observational data where this classical overhead diverges, such that all classical models for the less-natural temporal direction require unbounded memory. We illustrate scenarios where classical favoritism for particular causal orders vanishes when quantum models are permitted, thus highlighting a new mechanism for the origin of time’s arrow. They're talking about where the arrow of time comes from. They don't deny that there is one. And that's all I need for QM to obey causality and not retrocausality. Newton's mechanics are time-reversible too, but we don't say it has retrocausality. Do you know about the idea of boundary conditions setting the solutions of differential equations? Particularly, partial differential equations? The universe seems to have a simple boundary condition 13.5 billion years in the past. Things that are further from this boundary condition a timelike direction are later. The symmetry of the rules of QM say that on the other side of this boundary condition - if there is one - forwards in time would be pointed the other direction, what we'd call into the past. But on our side of that event, forwards in time is forwards. Greater proximity to this simple boundary condition is what we mean by 'earlier', and being further from it is what we mean by 'later'. This continues to apply in QM theories without parameter time ('timeless physics'), which you may have heard of. Most importantly, events closer to this boundary condition are logically prior to things further from it, and not vice versa. Greater proximity to this simple boundary condition is what we mean by 'earlier', and being further from it is what we mean by 'later'. Interesting. So you believe that we have memories from the past since the particles in our region of the universe move away from a boundary condition? I assume this would be somewhat similar to a particle moving away from a black hole, or a particle decelerating from light speed. Then, if particles moved towards a boundary condition, you think brains formed by such particles would have memories from the future? I assume this would be somewhat similar to a particle falling into a black hole, or a particle accelerating towards light speed. So you believe that we have memories from the past since the particles in our region of the universe move away from a boundary condition? I assume this would be somewhat similar to a particle moving away from a black hole, or a particle decelerating from light speed. Not exactly. It's more like if you have a guitar string, and you pluck on it, and release it. You have the boundary conditions at the ends of the string, they persist in time (because it's finite), and you have what is called the initial condition - what the state is when you release the string. But that's just a boundary condition along the past end of the string's history. When you're calculating out the string's history future, for each section of the string, you look at the past neighborhood - the position and velocity of itself and the neighboring parts of the string. You look at that side because it's closer to the initial condition. Looking at the future neighborhood doesn't help because there isn't a constraint there. The future uses you; you do not use the future. If you are doing it backwards in time, then it's nominally the future end, but really effectively it's the past end because it's what was fixed. You knew about that part before you knew about the things further backwards, if you're solving the equation numerically. And the second law of thermodynamics is acting in that direction, with more order towards that fixed point and less further away. It brings the vibrations up to a plucked string just in time for you to release it, if you run it 'forwards', but if you run it backwards, it looks normal. So in no event do you get memories - or any consequences - from the future. Unless, that is, there happens to be a boundary condition at both ends. But you'd immediately know about that because of massive violations of the second law of thermodynamics. Specifically, it wouldn't be like your having memories from the future. On your graph, we'd be around t = 5 or t = 95, and everything between 30 and 70 is what we'd think of as 'heat death of the universe' kinds of conditions. Another way of looking at it is that there are two universes there, and they have the same endpoint, but under time-reversal symmetry. Hmm... to me it seems like the big bang boundary condition gives "energy" to keep the particles alive, and that is why we get memories from the past, which is closer to the big bang boundary condition. But this energy declines over time, and that is why radioactive elements have a half-life. Maybe all particles have a half-life, but the half-life of a proton is so long that we haven't really observed any proton decaying. However, if a proton starts to get "energy" from a future boundary condition before that, it might never decay, but rather become increasingly retrocausal. B) the 'energy' you've put in quotes is a lot like thermodynamic free energy, but I wouldn't want to guarantee that it's exactly the same. C) in the retrocausal regime, you'd see an exponential un-decaying as decay products seemingly randomly flew in and combined. It would be exactly like normal events going backwards. The only time when physics would make sense in both directions is when everything is at maximum entropy already - heat death of the universe conditions. When you have as much organization as a person, only one direction makes sense. I don't think it would look like that at a macroscopical scale. Only at a microscopical scale. It wouldn't necessarily make all the variety of macroscopical structures we have today, but rather just assimilate particles into a super highly organized microscopical structure, which expands until it has incorporated all the particles at the boundary condition. I'd ask why you would think so, except that the rest of the paragraph is word salad. You have left the realm of physics and entered word games that aren't even philosophy. If you made a simulation where you made the conditions so that the second law of thermodynamics was reversed, I think you would see that things started to organize themselves at a microscopical scale, and it wouldn't necessarily look much like a video of the universe in reverse. except that the rest of the paragraph is word salad. You have left the realm of physics and entered word games that aren't even philosophy. I also think Jordan Peterson is right in that we need some kind of deeply rooted narrative. But when Jordan Peterson quotes from the Bible, I probably feel a bit like you do now, since I haven't been raised a Christian. However, his quotes from the Bible appeal to large segments of his fan base, since they have been raised as Christians and identify with the Christian narrative. To me, however, it seems like word salad. Use of cognitive capacity was measured during reading of text in six experiments. Content features of the texts were varied. A secondary task technique was used to measure use of capacity. In all experiments, capacity was filled more completely while reading narrative text than while reading expository text. The finding was generalized over two pools of passages, over two modalities of secondary task probes— auditory and tactile—and over two secondary tasks—simple reaction time and choice reaction time. Three hypotheses for the narrativity effect were investigated. Not supported were an hypothesis based on the interest value of the passages and the hypothesis that difficult to comprehend passages induced problem solving cognitive operations that filled capacity. The results were consistent with a comprehensibility hypothesis, which states that when more meaning is produced in the reader's cognitive system while reading a text, more cognitive capacity is filled by reading it. Narrative passages produce more meaning because schemata for narrative texts are more familiar, more frequently encountered, and easier to comprehend than schemata for expository texts. And, as far as stories go, I don't think stories from Star Control 2 is a particularly bad choice, although I also like some of the stories by Greg Egan. Also, if the universe is expanding, aren't we getting longer and longer away from the heat death, since there are more possible configurations in a larger universe? 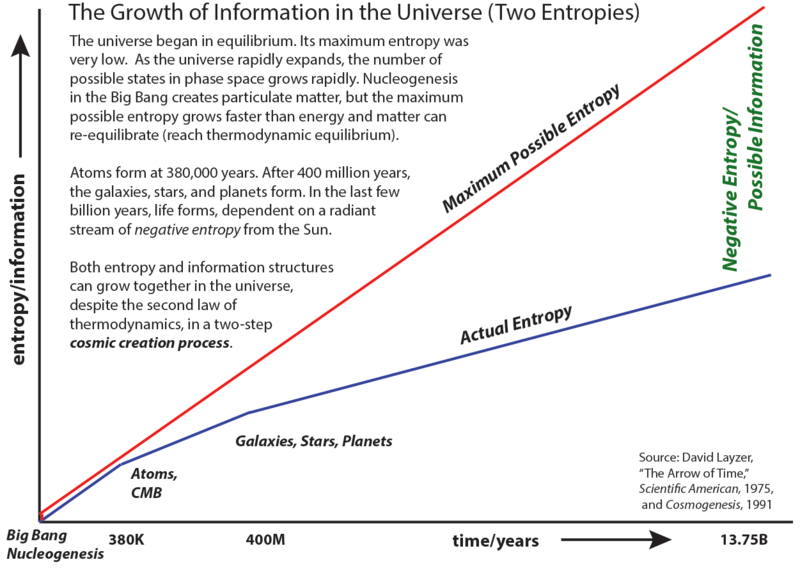 Is entropy a measure of our distance from the big bang, or a measure of our distance from the heat death? It is not necessarily obvious that not both of these distances could increase if we count the number of steps. If it is the case that antimatter is going back in time, couldn't it be that more and more matter changes into antimatter as the universe progresses forwards in time, while more and more antimatter changes into matter as the universe progresses backwards in time.